Quilting and math - patterns! Mathematics has been called the science of patterns, and here's another field that is all about patterns: QUILTING. Fascinating patterns and lots of eye candy! 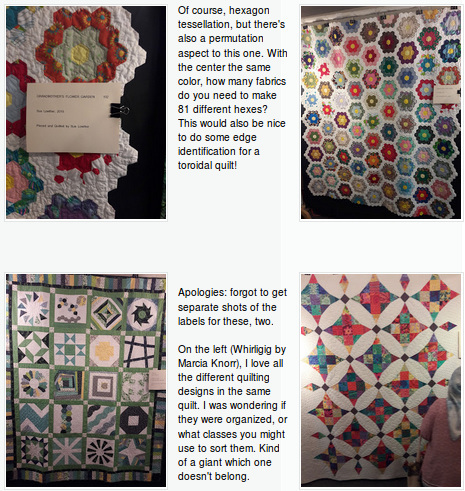 Go check out this math teacher's take on a visit to a quilt show with tons of beautiful pictures. Enjoy! 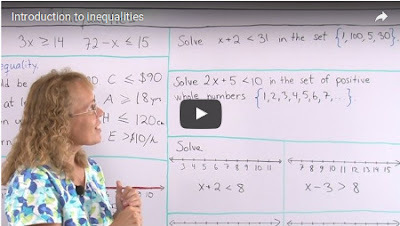 A short video on NUMBER SENSE - the ability to work flexibly with numbers. - 9-trick: The nine wants to become ten, so it takes one from the eight. Thinking this way, 8 + 9 becomes 7 + 10 which is an easier problem. - doubles: 8 + 9 is really close to 8 + 8. If the child remembers that 8 + 8 = 16, then 8 + 9 is just one more. - Similarly, 8 + 9 is just one less than 9 + 9. 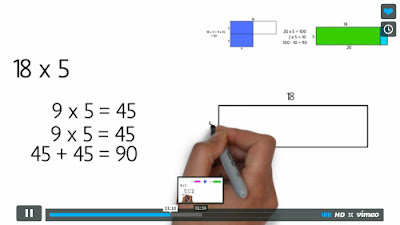 The same type of strategies can then be used in solving more complex addition problems. But the most important thing in this is that number sense has been proven to predict a student's success in algebra. Check out Jo's video here. 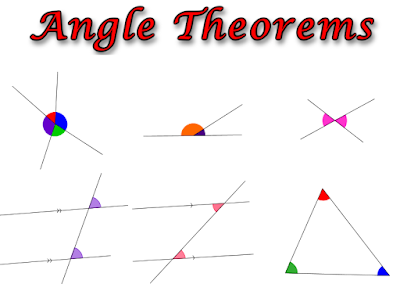 Includes for example such basics as angles around a point add up to 360 degrees; vertical angles are equal; corresponding angles are equal; and results about the angle sum of a triangle, a quadrilateral, polygons; plus a few more. Go check it out! I feel not only teachers, but students also might enjoy browsing through the page. Here's a handy index or list of my video lessons specifically meant for 6th grade. You'll find topics such as percent, decimals, ratios, statistics, beginning algebra topics, and more.